And dance you a jig. When the book was published in 1964, its reviews were less than stellar. Yet these days, a first edition of this little known book sells for upwards of two hundred dollars. Although SWEET AS A PICKLE... is the author's only work published specifically for young readers, her earlier title, A MEMBER OF THE WEDDING, would likely be called an "honorary young adult novel," since it's been taught to, read by, and loved by generations of young readers. The story of twelve-year-old Frankie (F. Jasmine) Addams remains a landmark character study of a girl struggling with the pain and loneliness of growing up. 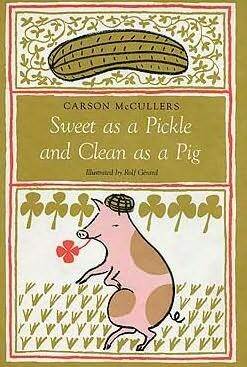 It's amazing to note how many twentieth-century writers for children and young adults were inspired and influenced by the writings of Carson McCullers. Sara Zarr (STORY OF A GIRL; SWEETHEARTS) cites MEMBER OF THE WEDDING as one of her five favorite novels. Newbery winner Virginia Hamilton said she was inspired by the work of McCullers. Kimberly Willis Holt, who won the National Book Award for WHEN ZACHARY BEAVER CAME TO TOWN, remembers reading McCullers' THE HEART IS A LONELY HUNTER at age twelve: "It was just life-changing because of the characters. That was the first time I read a book where the characters seemed like real people to me." M.E. Kerr has written about reading MEMBER OF THE WEDDING repeatedly during her teen years, seeing herself in the character of Frankie, but also seeing "a future me in Carson McCullers. She became the one I most wanted to write like, and all my stories began to describe 'a green and crazy summer,' or 'a green queer dream,' or 'a crazy queer green time.'" One writer for children and young adults got to know Carson McCullers personally. My journal records our meeting this way. "In the midst of a large bed is a tiny person with enormous brown eyes and short ragged hair. She is so frail that there hardly seems to be a body under the covers. One hand is doubled up and stunted, like a little paw. I shake the other. She stares at me with her huge eyes, and suddenly none of the amenities are possible. She has had strokes, heart attacks, and cancer. She is almost completely paralyzed. I feel that I am not meeting a person at all, but a soul. She is exactly like her books." For the next two years, I visited Carson McCullers every day -- read aloud to her, went shopping for her, ate meals with her, and loved her deeply. She was not easy to love, but before me always, in my mind, were her books. Her great books. Unable now to write physically, she dictated stories to me, phoned in the middle of the night with ideas for novels or fragments of poems. She had written her last book, CLOCK WITHOUT HANDS, by typing it with one finger, one page a day. Now she was beyond typing, but the stories and the poems kept surging through her frail body. ...if her world was one of alcohol and dreams, we knew, all of us who loved her, that she would be leaving books behind whose beauty was beyond price. Until the moment she died, at age fifty, she was the epitome of the word Writer. How odd that a chance request to read to "an invalid" would unite a talented newcomer to the writing field, Barbara Wersba, with one of the literary greats of the twentieth century. It must have been fate. We can't know how much, if any, McCullers influenced Barbara Wersba's writing (though there is at least one scholarly article out there called “The Power of Androgyny : Echoes of Carson McCullers in Barbara Wersba's Novels for Young Adults") but, based on what Wersba has written, McCullers certainly had a major influence on her life.